US size 2,4,6,8 and 10 in Yellow (as in picture) are in stock ready to ship. Other sizes and colors will be made from scratch which takes about 2 weeks. Looking for a unique prom/evening dress for your next event? Want to shine like a celebrity? 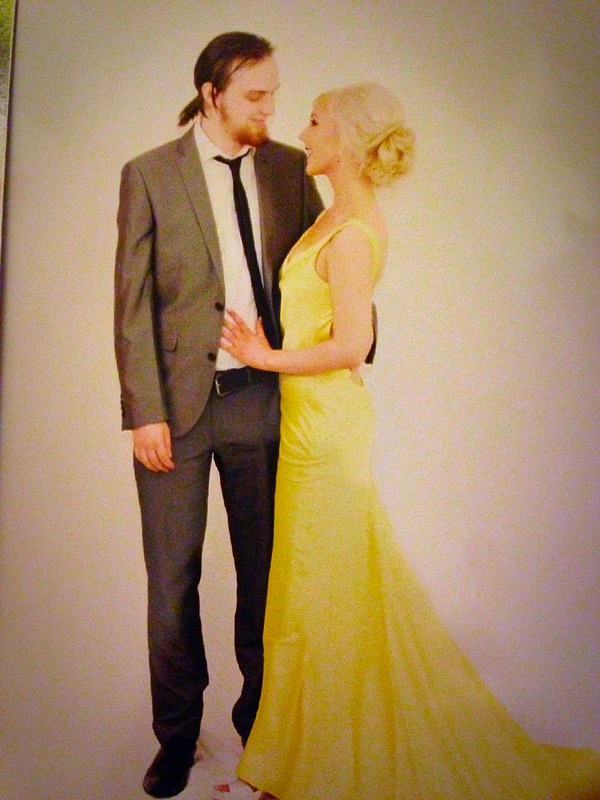 This yellow prom dress is your best choice! 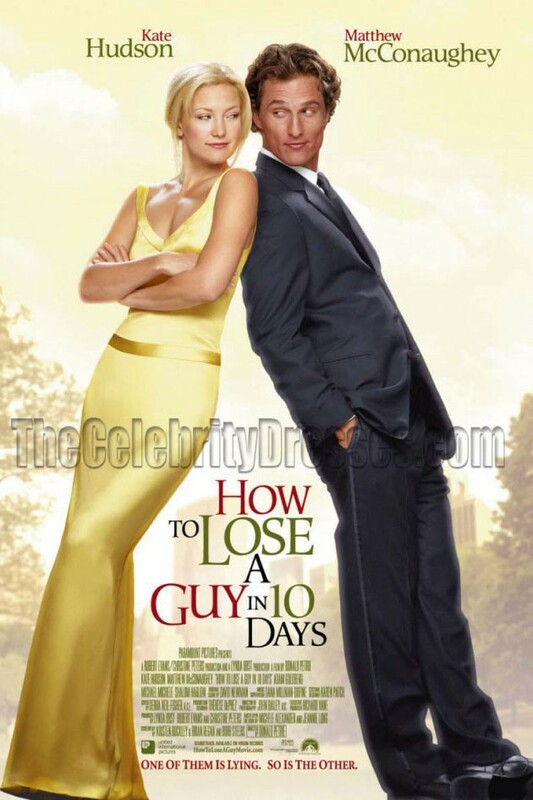 Kate Hudson made fashion headlines when she wore this beautiful yellow evening dress in the movie How to Lose a Guy in 10 Days. 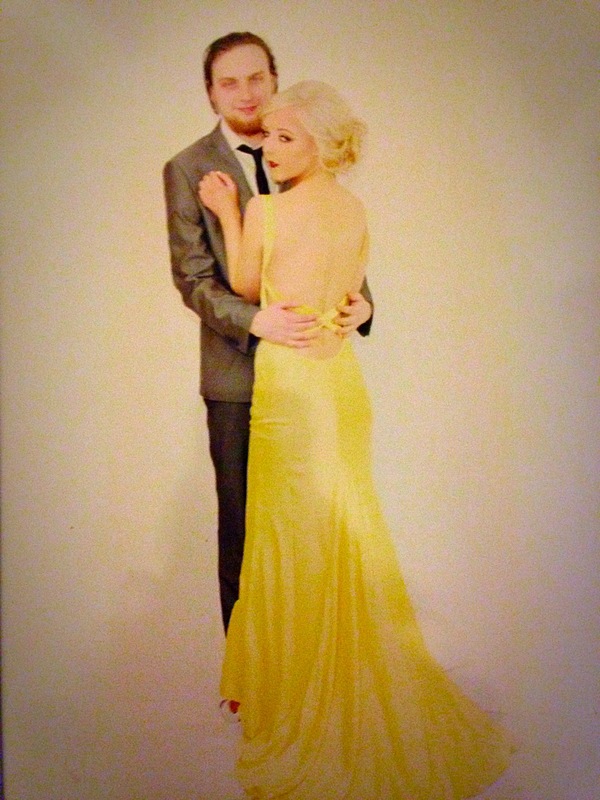 Now you can capture the same star look with a Kate Hudson style yellow Prom Dress! Silk satin skims the body in this low back pageant gown. The back of the yellow prom dress is accented with criss cross straps and it has a slight flare at the bottom. This yellow evening/pageant/prom gown is super sweet and eye-catching! 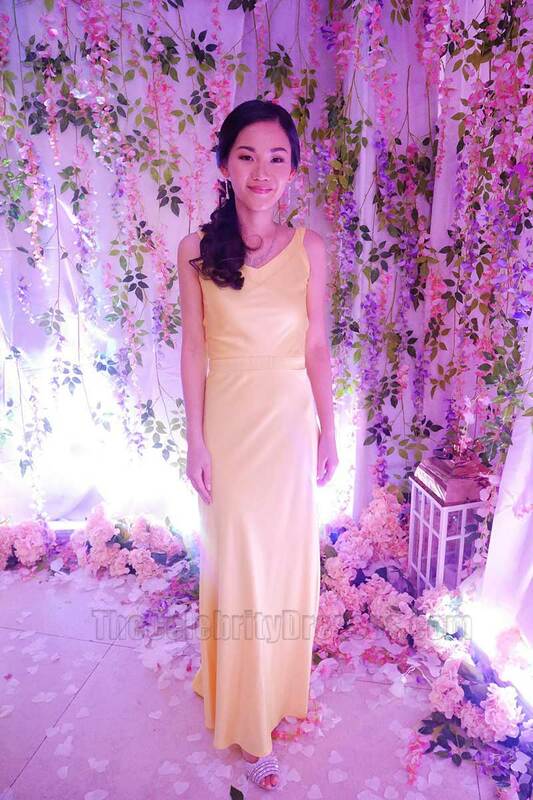 You will stand out stylishly at any special occasion in this simple, classic and timeless yellow gown! How to Lose a Guy in 10 Days Dress,MUST HAVE!! Q: I would like this dress with slightly less of a train but also need a few more inches added in length to the front. Would this be considered custom sizing or can you do this at no additional cost? A: Hello Heather, Yes, it will be considered custom sizing, but we can do that without extra fee. Please include your request in your order comment. You will be able to leave a comment at the last step checking out before making payment. Thank you for contacting us. A: Dear Donna, We provide the silk fabric option for the dress. Thank you for contacting us! A: Hello, Yes, please select other color option for your order and add the request of navy in your order comment at the last step of checkout. Currently, the tailoring time is about 2-3 weeks. Thank you for your question. A: Dear Kim, Yes, please select the other colors option and add the request of lavender color in your order comment at the last step of checkout. Thank you for contacting us! Q: Hi! I was wonder if I could have the color chart sent to me? Thanks! A: Hello Bridget, We just sent the color samples to your email. Please check them and add the request of color # in your order comment at the last step of checkout. Thank you for contacting us! Q: My first question is do I measure the length flat footed or with heels? Also if we don't want a train can you just make the dress all one length or maybe just an inch or two longer in the back? Thanks so much! A: Hello, Please measure the length with your shoes. Yes, we can do that.Please add your request of this in your order comment at the last step of checkout. Thank you for your question. Q: Hi just wondering if you could please send me a color chart? Also is it possible to have a lower neckline and shorter train? A: Dear Alice, We just sent the color chart to your email. Please check it and add the request of color # in your order comment at the last step of checkout. Yes, we can make the dress with a lower neckline and shorter train. Please also add the request of this in your order comment at the last step of checkout. Thank you for contacting us! Q: Please send the color chart for the Kate Hudson yellow dress, I'm planning to place a custom order for New Year's Eve. Thank you. We just sent the color chart to your email. Please check it and add the request of color # in your order comment at the last step of checkout. A: Dear Caralynn, We just sent the color chart to your email. Please check it and add the request of color # in your order comment at the last step of checkout. Please select custom size option for your order and add your measurements in your order comment. Thank you for your interest. This dress was absolutely beautiful, the quality and color was perfect. I ordered a custom size and the fit was perfect from the waist down. I had to alter the top tighter. I wished the neckline was lower on me but it still turned out pretty. Overall this dress was a wonderful purchase, received many compliments and the shipment was surprisingly very fast. i never EVER write reviews but have received this dress and am amazed. i had very low expectations of quality and fit (despite all the reviews i read). it arrived yesterday and i was surprised how heavy the material actually was and by how forgiving the dress is..... i was expecting a heavy investment in magic knickers but no, it skims in all the right places and makes me look like 2 sizes smaller. the cut is generous and the material quality is good. Quite frankly am absolutely amazed and have just ordered another in a different colour. if you have any doubts, put to one side and order it - i would be very surprised if you are anything less than delighted. I would just like to share my pictures with you from wearing the beautiful Kate Hudson dress I purchased from your website. I loved it that much I had to share them with you. I bought my dress in lilac it is lovely unfortunately it is big for me :( but nothing a dress maker cannot handle. If you worried about the quality or if the dress will not look like the picture don't be. Just worry about getting the correct measurements so go to a professional and get them to measure you. I ordered this dress for a Christmas wedding. Was looking for a dark Green customer service send me an actual Fabric catalog photo. The dress fit was perfect, quality very good. I was expecting such a good outcome. Although i had put some wait on hips and waste i went for size 4 instead of 6 and it was perfect. Only minor adjustment i had to make was on breast as am a bit smaller. Nothing hard to fix. Overall amazing dress!!! The best dress I've ever seen! First of all I want to thank staff of this high quality shop. Great communication and helpfulness of staff is a great advantage of the shop. As for the dress all words of admiration have been told. That's why it remains only to join to all positive feedbacks. I've ordered custom color - ivory, and I'm really satisfied with it. Everything is perfect: seams, cut, quality of the fabric. I'm very pleased with the purchase. If you got any doubts, don't waste your time for reflection and buy it asap. I ordered a ready made size 4 and got it in one week! The dress is beautiful and it fits me perfectly!